Ashoka Gears manufacturing Girth gears for most of the industries from past 50 years. Gear is a important component in the gear drive assembly. Girth Gears made in multiple segments, which can be 2, 4 or 8 equal sizes, in other area girth gear are also known as split ring gears. Girth gears mainly using in heavy industrial mills, steel re rolling mills, kiln drive system, paper industries. We as a girth gears manufacturer, exporting and supplying quality girth gears with high efficiency and quality. The tool Girth gears is very popular and useful due to economical manufacturing cost and quick install in comparison of other gears. these gears are durable and life of girth gears depends upon lubrication and alignment. Different industries prefer and give first choice to girth gears due to its economical cost, quick and easy installation and low operational cost. 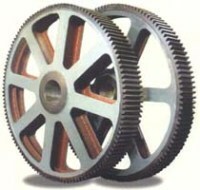 Girth gear is mostly used in kiln drives and mills. The industries, where Girth gears are used are sugar mills industries, paper mills industries, steel and iron industries etc.